Almost everyone has experienced that one spot in their house where the wireless signal just isn’t as strong as it should be. It might even show up when you’re trying to stream Netflix across the house, and you can’t figure out why the signal just isn’t up to par. The truth of the matter is that the signal has more to do with the structure of your house than the viability of the signal itself. Walls get in the way and cause signal degradation the more there are between your device and your router. Ideally, you’re going to want a solid wireless signal everywhere because you’d love to have a strong signal in every room in the house, but up until more recently, that wasn’t entirely possible without extenders, and even then, it wasn’t always effective. That’s where the latest trend in routers, wireless mesh networking, comes into play, and it is fabulous. How does Wireless Mesh Work? Do You Need Wireless Mesh? Wireless mesh is the next big thing in networking, and it’s so much more than you would think. It’s not just a new wave of routers. It’s an entirely new technology that can improve wireless availability in your home. Think about the way a net covers a surface, and you’ve got a visual representation of how a mesh network functions. Not only does it cast a virtual net over your home, but it is also easy to configure because aside from initial setup, mesh network devices will take care of the rest by themselves. Mesh networks are effective at solving a major problem that has plagued wireless networks for years – covering a single large area when there are no network presences physically available. All those dead spots that happen in traditional wireless networks are no longer a thing thanks to wireless mesh networks. Mesh networking uses several bases to extend the size of the network. Each node exchanges data on a consistent basis from node to node. Because of the way they communicate, each node is aware of the other nodes within the network. A key difference is that mesh networks do not actually transmit the data through the various base stations. Instead, the nodes work to adjust and decrease any potential virtual interference and extend the range of the signal. Their functionality leads to higher throughput than what most wireless routers provide. Some mesh routers are single band, and others have multiple bands. More bands lead to better functionality. As an example, the Eero has three different bands which allow for bands that are dedicated to reducing potential congestion on the same channel. have any issues communicating with a Linksys router connected to a Belkin switch. Wireless mesh protocols have not yet been standardized, so while they are compatible with 802.11 equipment, they may only be compatible inside your own home, but not necessarily compatible with each other. In other words, you can’t put an Eero inside of a Google Wifi mesh network because they aren’t going to be compatible. Once you’re in, you’re stuck unless you get a whole new setup. The problem with this is that because the technology is still so new for consumers if a company were to fold and disappear, you would be out of luck getting any support later on. No support would mean you couldn’t call someone if you needed something, no warranty coverage, inability to purchase new pieces, and access apps wouldn’t be updated anymore. Additionally, if there were ever any major security flaws that showed up later, you might never get that needed update. So when you ask whether or not you need to get a wireless mesh network setup, it’s not an easy yes or no kind of answer. Is the efficiency more important to you now than the long-term possibilities? Alternatively, are the long-term possibilities a deal-breaker for you right now? You’ll have to weigh the answers to those questions and be prepared in case the startups like Eero were to ever go south. If you decide to go forward with a mesh network, it’s a good idea to compare different mesh network specifications to see if there are any preferences between them. It’s no wonder that Google Wifi is at the forefront of this latest tech, especially since Google needs you to be online. If you weren’t online, chances are Google would eventually cease to exist because then not hardly anyone would be online searching the web. It would be like we went back to the early 1990s – the horror! With that said, Google knows how to make their equipment work with the web, and do so seamlessly. If you’ve ever used Google products, you’re going to be ahead of the curve because you’re going to intuitively know how it needs to be setup. Setting up Google Wifi is as easy as most plug and play devices. You turn on the first unit and connect it directly to your modem. Make sure you download the app so you can monitor and finish setting up your nodes. After that, you’ll get real-time instructions on what you need to do next to set up the remaining additional nodes. It doesn’t take more than a few minutes, and then you’re done. When setup has been completed, with three nodes, you’ll be able to cover approximately 4500 square feet of house space, so even larger homes can take advantage of the coverage provided by a mesh network. As you explore the app, you’re going to see that there are some really cool features that you’ll especially love if you have kids that might play Fortnite for just a little too long these days. That’s right. You can set the amount of time allowed by the device from your app. Then when their internet connection goes down, and they cry out, “Mo-om” or “Da-ad, it stopped working,” you’ll know why and subsequently send them outside to play. Unless it’s 2 am, in which case they might just be tired enough to go to sleep. One of the best things about the easy setup and reliable connectivity with Google Wifi is the way that it updates seamlessly. They keep updates going on a regular schedule, so you know that your network is always going to be secure so long as Google Wifi sticks around. You can find Google Wifi online directly from Google, or you can purchase them at places like Best Buy and Fry’s electronics. Currently, they run around $ for a set of three stations. Business Insider compared a few mesh networks to include Google Wifi. When the speeds were tested at the main router, the performance was exceptional and delivered a consistent 100Mbps or more download speed, and an excellent 35Mbps upload. However, when they tested the various satellite nodes, the download speed lost a lot of strength, but the upload speed stayed consistent. This was not the case with others that were compared, and the Google Wifi performed the worst at the satellite points. Eero is a pioneer in consumer mesh tech, and their latest model is the second generation of their product. It is a tri-band mesh system complete. One of the bands is dedicated to intra-node communications, so as the nodes talk to each other, they don’t interfere with the overall bandwidth capacity. The beacons themselves are polished, small, and aesthetically pleasing to behold, especially if you’re into the whole minimalist look. You’ll get fantastic coverage without really obvious placements of individual units. Plus, you can add as many beacons as you want to and it won’t have an issue with connectivity. Eero also provides a fast and efficient network due to the way the bands are configured, even across larger distances. Even adding a new beacon is easy. Once you plug it in, you’ll get a notification on the app to do an update. After you update your newest addition, it will seamlessly integrate into your entire network. Setup is about as easy as it is for the Google Wifi mesh. Before you plug anything in, though, you’ll need to download the app to get it taken care of. The app is very user-friendly and talks you through the entire process to get you connected in next to no time at all. Even if you’re not familiar with technology like this, you’ll still be able to follow the instructions relatively easily. You’ll also notice that there is a base unit as well in addition to the two other beacons. Only the base unit has an ethernet port, so keep that in mind when you’re going through your setup process. The Eero app is easy to read and even easier to navigate. You can find everything you need to know by checking out your app to see what is going on inside your network. Information found in the app includes device usage, diagnostics, and the ability to shut down the internet as needed. In other words, when your kiddos have been watching too many Minecraft videos or playing too long on some other online game, you can temporarily disable their part of the network and get them to rejoin civilization for a bit. In all seriousness, though, the app has excellent functionality and usability. You’ll love what you can see. Eero functions very similarly to Google Wifi. They have rolling software updates on a regular basis, and each update provides the newest security additions. You can also manually update the network via the app. As soon as you install your network, you’ll immediately get a notification on your app asking if you’d like to install updates. You tap the button, and then the updates just start. If you don’t get a notice, that’s okay, too, because it just means that your Eero is fully updated already. Just make sure you’ve got the latest app version, too, and it will be smooth sailing for you the entire time you’re getting updates. The Eero was another one of the units that was tested over at Business Insider, and it had exceptional performance all the way around. The primary router reported a download speed of over 100Mbps and an upload speed of approximately 35Mbps. When they tested the connectivity over at one of the beacons, the reported download speed remained the same 100Mbps or more, and the upload speed consistently stayed at 35Mbps, too. Now that you’ve got some information on these two different mesh networks, here’s a quick breakdown into the pros and cons of each one so you can weigh them against each other. The design of the nodes are sleek and look nice on a shelf. The setup is the most natural thing in the world thanks to the simplicity behind Google’s creation. The app is user-friendly with everything. Network controls are also easy to access. Updates happen without any manual intervention ever. This is the least expensive when it comes to wireless mesh network equipment. Excellent download and upload speeds at the primary router. While the performance is good, it’s not as good as the Eero. You’ll only find two ethernet ports on the main unit. It might be the most inexpensive, but it is still $ for a set of 3 or $ for a single node. Google Wifi uses proprietary protocols and so will not work with anything else except for other Google Wifi nodes. There is significant signal degradation at the satellite nodes. You can expect excellent performance with the Eero. The design of the beacons and the main unit are compact and very low-profile. The app is user-friendly and easy to work with in setting up and updating as well. Updates happen automatically, too, without intervention, but you have the option to manually update if you want to. Excellent download and upload speed at the primary router and the satellite beacons. Parental controls are available on the user-friendly app. There are only two ethernet ports on the main unit. It is the more expensive between the two. Eero is a startup company, and it is difficult for startups to succeed, so you may or may not end up getting needed support later. 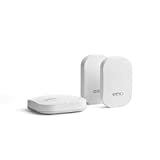 Eero also uses proprietary protocols, so you cannot combine multiple types of wireless mesh network devices with it. The one you should buy is going to depend on your personal preference as well as your overall budget. Both choices make it possible to improve your overall network performance, and each covers an impressive amount of square footage. Google Wifi will do what you need it to do very well and for a smaller price tag. Plus, you get three units with their set for $. The Eero is considerably more expensive for a two-pack that covers an equivalent square footage. It runs around $ for a three pack, and it will cost you $ for a two-pack. That’s a huge difference in your wallet for a similar performance. The only thing that would push you to consider the Eero over Google Wifi would be if you’re a gamer type. Eero does have better download and upload performance, while Google Wifi is worse when you compare upload speeds. For basic streaming, they both function very well, so for the average person looking to improve their overall network connectivity, Google Wifi would be the way to go because it is so much cheaper and still offers excellent performance.